The holidays seem to be all about eating—so I thought I’d offer a recipe to enjoy during your festivities. While traveling around Australia, I had several encounters with a really lovely dessert called a Pavlova, named for the great ballerina. While Pavlova is massively popular all across Australia, where it is viewed as a fair dinkum Aussie creation, New Zealand also lays claim to this dessert. However, there is no definitive proof as to who really created it first. The main difference between Pavlovas in the two countries would be the topping: in Australia, you’d most likely see passion fruit, while in New Zealand, kiwi fruit would be a more common topper. (And it’s kiwi fruit, by the way, not kiwi – kiwi is a bird, or a nickname for New Zealanders – Americans may not care, but Kiwis do.) A nice combo of blueberries and sliced strawberries would be attractive and tasty, as would raspberries. Because it’s winter here in the Northern Hemisphere as we celebrate Christmas and New Year’s Day, if fresh fruit isn’t possible, feel free to thaw out some frozen berries to top off this elegant confection. And Happy New Year. Place oven rack in center of oven. Preheat oven to 250 degrees. In a large, clean bowl, beat the egg whites on medium-high speed until they hold soft peaks. Start adding the sugar, a tablespoon at a time, and continue to beat until the meringue holds very stiff peaks. Sprinkle the cornstarch and vinegar on top of the meringue and beat a bit more, until stiff again. Now you make your meringue cake. Opinions differ as to how to approach this. You can put down a sheet of baking parchment and draw a 7-inch circle in the middle. You might also get a pastry bag and pipe a circle and then fill it with a perfectly even rope of meringue. I just guesstimate the circle size and spoon the meringue onto the baking sheet, spreading it into a circle of about the right size. Do what works best for you (that is, pick a method that makes it likely you won’t write this recipe off as too complicated). Also, baking parchment might make it easier to get the meringue off the pan. I have used it. I have also just sprayed a cookie sheet lightly with baking spray, and I’ve had it slide off with no trouble. Anyway, whatever method you choose, you now have a circle of meringue, looking rather like a single cake layer and a little more than an inch deep, on your baking sheet. Put it in the oven and bake it for 1 hour 15 minutes, or until the outside is dry and takes on a very pale cream color. Turn the oven off, leave the oven door slightly ajar, and let the meringue cool completely before removing from the oven. Set the meringue aside until just before you plan on serving the dessert. Then, whip the cream until soft peaks form. Add the sugar and vanilla, and beat to incorporate. Spread the whipped cream across the top of the meringue. Decorate with the fruit you’ve chosen, and serve. Serves 6 to 8. Notes: If you’re using passion fruit, you’ll need 10. For kiwi fruit, four or five should do the trick. For berries (blueberries, raspberries, sliced strawberries, blackberries), you need about a cup. The meringue can be made a couple of days in advance. Once it is completely cool, put it in an airtight container and keep it someplace cool and dry. It’s important that you don’t complete the dessert until you’re ready to serve it. The acid in the fruit will break down the whipped cream and the whipped cream will make the meringue soggy. If you don’t want to serve all 6 to 8 servings at once, you can either cut up the meringue and just add whipped cream and fruit as you serve it (not so great on presentation, but the taste is the same), or you can make a couple of smaller meringues. 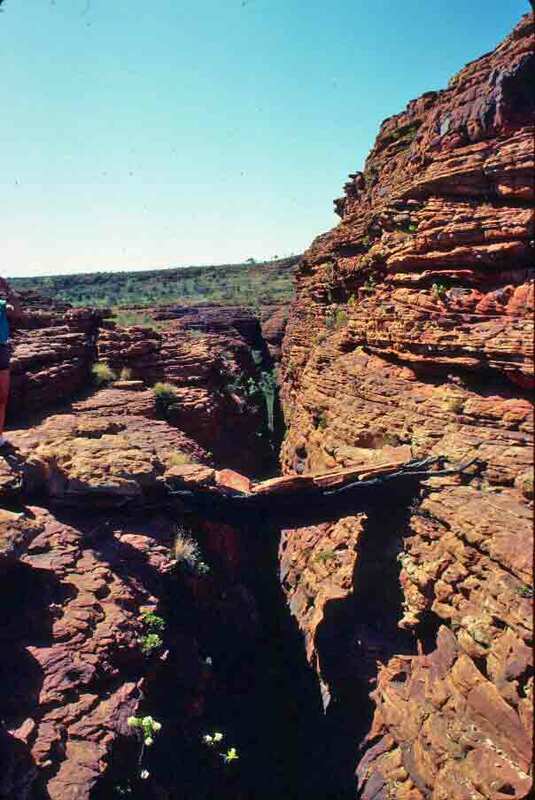 Kings Canyon is in the arid Red Centre. 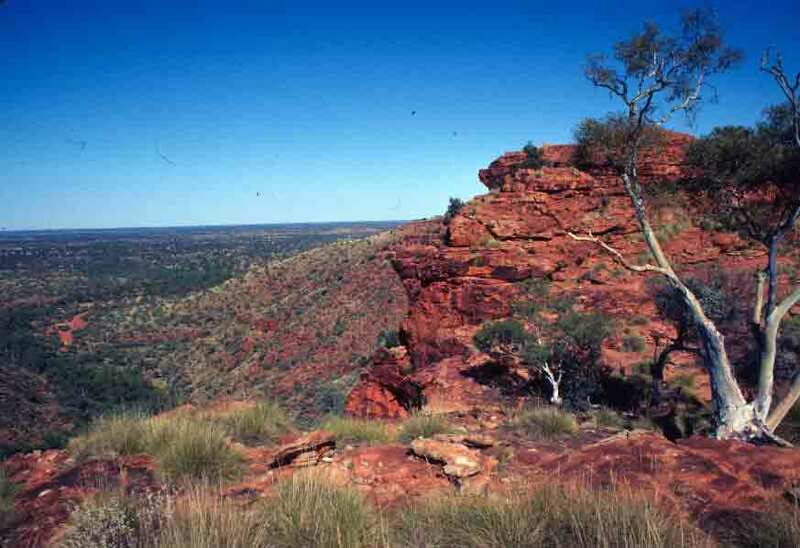 The top of Kings Canyon reflects this, with only a few tufts of dried spinifex and an occasional ghost gum dotting great stretches of weirdly sculpted red rock. But in the crevices, touched by the sun for only a brief time each day, and where water can be held like a treasure, there are wild flowers and macrozamia palms thriving, clinging to life in a seemingly unlikely place. And then there’s the Garden of Eden. This is more than a crevice; it’s a deep cleft in the rock carved by the passage of a small stream. Here, the plants are lush and chaotic, and a large, clear, rock-cradled pool makes it hard to remember you’re in the desert. 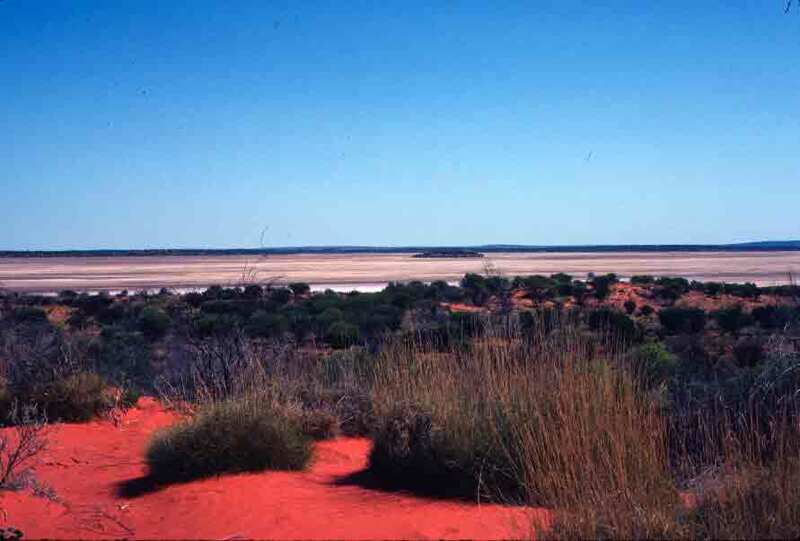 Australia’s outback is dotted with what poet Banjo Patterson called “phantom lakes” in his poem “The Droving Days.” These lakes can be real lakes, at times, when there has been rain, or when distant rains have been so great that water makes it down the usually dry rivers to fill these basins. When that happens, there is an almost miraculous explosion of life, from desert plants bursting into bloom to waterbirds appearing by the thousands to enjoy the warm water. Back to writing about Australia and my adventures there. It was while in the Centre, camping near Ayers Rock, that I first saw the constellation known as the Southern Cross. I have always enjoyed stargazing, and the Australian nighttime sky is astonishing, but this constellation delighted me beyond simply being a nice grouping of stars. Of course, this is no mystery; I’m sentimental. Orion has always been my favorite northern constellation simply because it was my father who first pointed it out to me, and I always associated it with my father. The Southern Cross had to be my favorite southern constellation because of its association with Australia, from its presence on the national flag to its mention in the Stephen Stills song of the same name. That was the first time I saw the Southern Cross, but not the last, not only on this first trip, but on subsequent trips, as well. In fact, the image below was shot on my fourth trip to Australia. I was camping with friends at Tibooburra in the remote Corner Country, and we were so far from civilization that night photography was quite easy. However, while I got a couple of good photos of the night sky, scanning the slides was not so successful. Any photographers out there have any thoughts on why my nice black sky on the slide turned into royal blue when I scanned it? I scanned it three times and couldn’t find a way to make the scan look like the slide. Photoshp Elements didn’t help, either. Any advice would be appreciated. Despite the “blue screen” effect, you can still see the Southern Cross just right of center. The two bright stars lined up to the left of the constellation are known as the Pointers, because their brightness makes them easy to locate and then they point you to the Southern Cross. The Pointer to the left is Alpha Centauri. 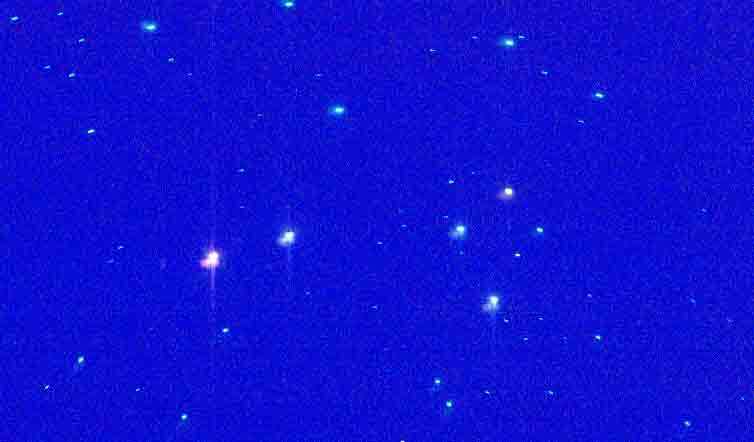 Actually a group of stars, rather than a single star, Alpha Centauri is our nearest stellar neighbor— the closest star system to our Solar System at just over 4 light years distance. 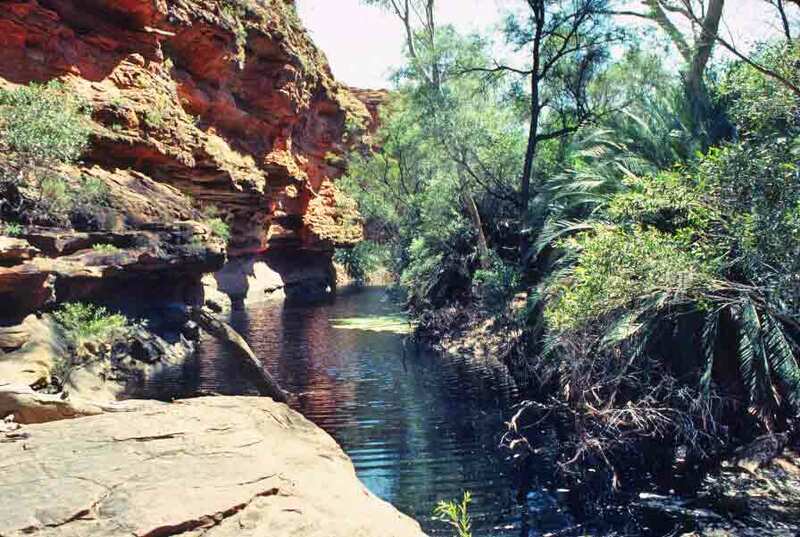 Riparian means “relating to, living on, or located on the bank of a natural watercourse.” While riparian refers to anywhere there is water, riparian areas are always more astonishing when they appear in arid country. One of my favorite sights, whenever I’m visiting a desert, is the sudden appearance of the surprising burst of luxuriant growth that marks the presence of water. 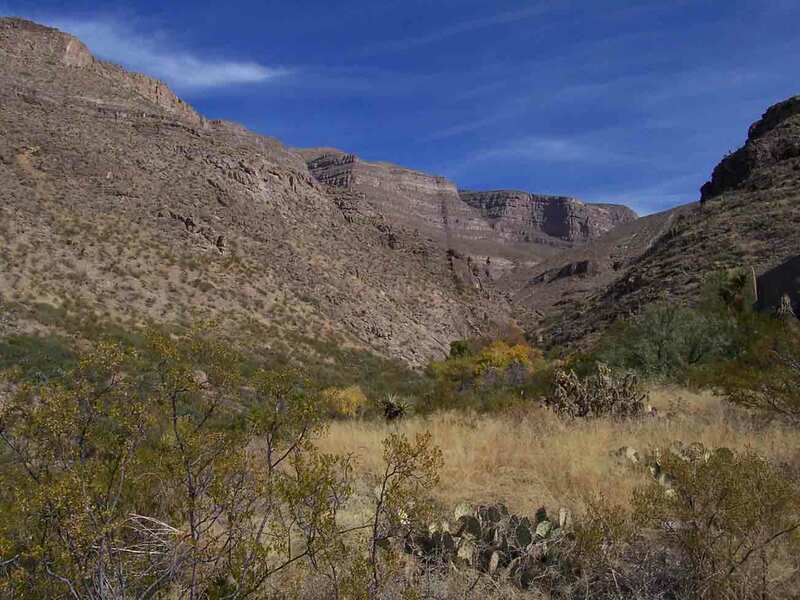 In southern New Mexico, at Oliver Lee State Park a few miles outside Alamogordo, There is a riparian area nestled between the towering cliffs of Dog Canyon. Here, flanking the cheerful little creek that bubbles and tumbles along the canyon floor, cactus is replaced by poplars and other deciduous trees. Cattails, horsetail, and ferns crowd the banks of the stream. It is lush and beautiful—and very narrow, with the desert still controlling the land only a few yards from the watercourse. The photos below were taken by the friend I was visiting in New Mexico. The first faces the canyon, revealing the fall colors of the trees clustered around the creek. The second faces away from Dog Canyon, across the expanse of the Tularosa Basin. 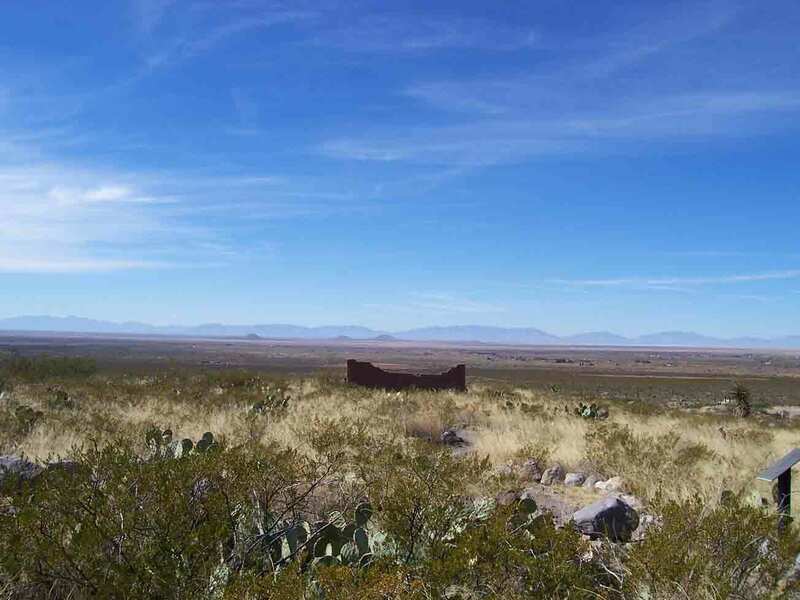 The broken wall in this photo is part of the ruins of a cabin built by a French settler in the 1800s, and pencil-line of white you can just make out to the right, at the base of the distant mountains, is the sun reflecting off White Sands. Just as I have taken a break from work, so too I am going to take a very brief respite from talking about Australia. I spent the last two weeks visiting friends in Alamogordo, New Mexico. Southern New Mexico is perhaps best known for missiles and rockets, as there are bases for both the U.S. Air Force and NASA in the area, as well as the splendid Museum of Space History. But even more than this, the area is a paradise for geology buffs. You can visit the Valley of Fires and see the aftermath of volcanic activity. You can wander through the astonishing, eroded boulder fields of City of Rocks or hunt for geodes in Rockhound State Park. You can browse through the geology museum in Socorro or shop for picture jasper and crystal clusters everywhere. 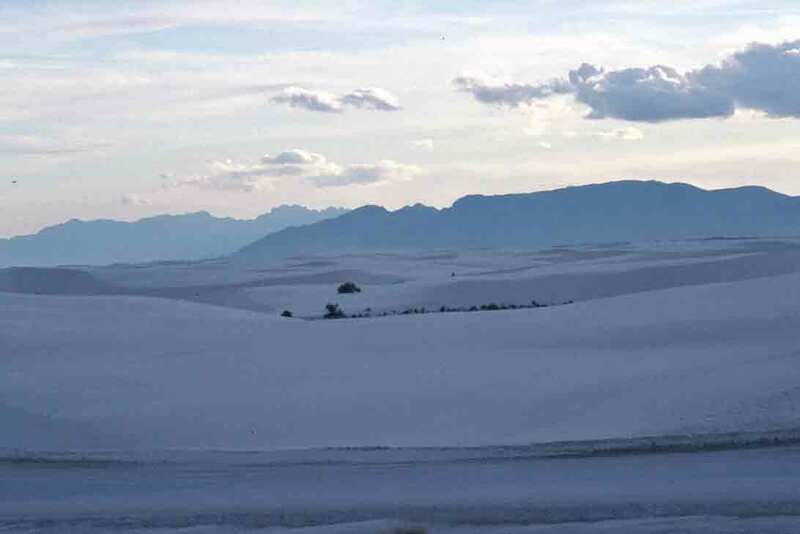 It’s all wonderful, but to me, the most remarkable thing of all is White Sands. 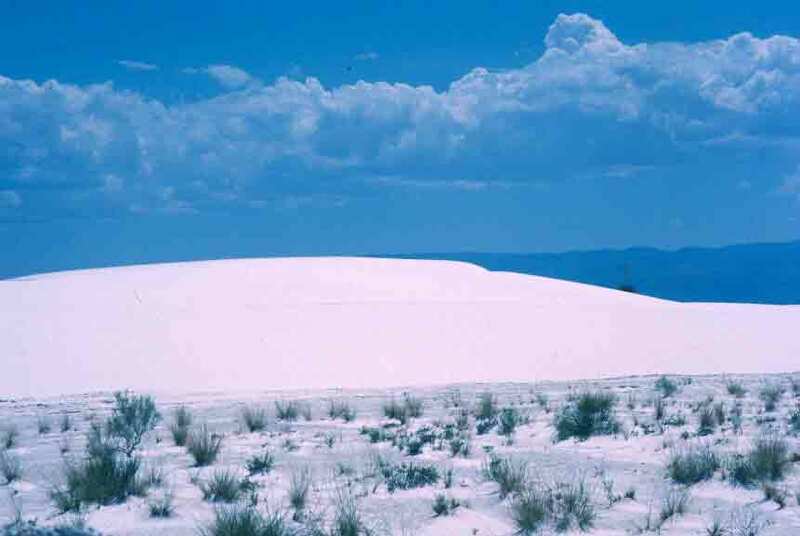 White Sands National Monument is a unique dune field of pure white gypsum sand. The tiny gypsum crystals are actually clear, but as they are driven by the wind, they are scratched, and the scratches make them appear pure white. The crystals are blown across the Tularosa basin but are too heavy to be carried over the bordering mountains. Hence, they are deposited in a snowy blanket on the windward side of the range. On the outer dunes, dark vegetation clings to life amid the shifting sands, but farther in, vegetation vanishes, and one is surrounded by an undulating field that looks like a winter wonderland—even when the temperature is in the 90s. It can be blinding, but it is always glorious. There are a variety of animals that have adapted perfectly to life in these dunes: white lizards, white gophers, white insects. 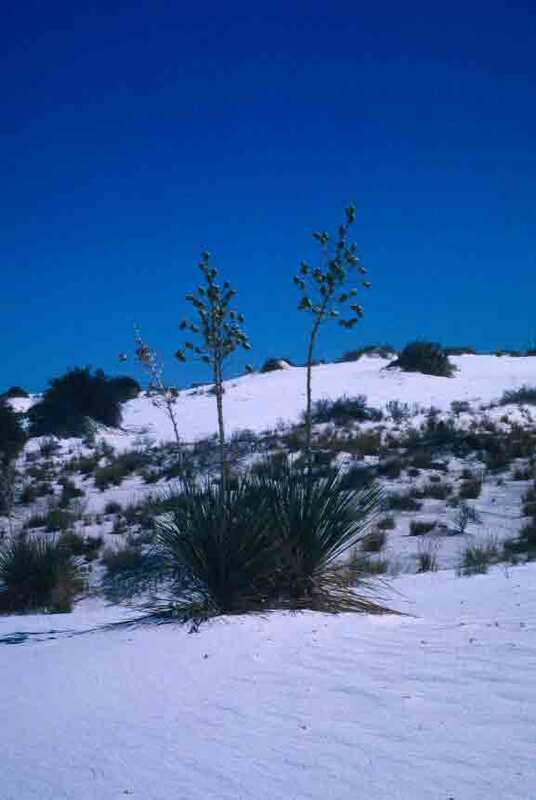 The plants have adapted, too, either growing in ways that stay ahead of the moving dunes or gathering sand in a network of roots, creating gypsum pillars on which to grow. Much of what is wonderful is typical of sands everywhere, most especially the sculpting by wind or rain. 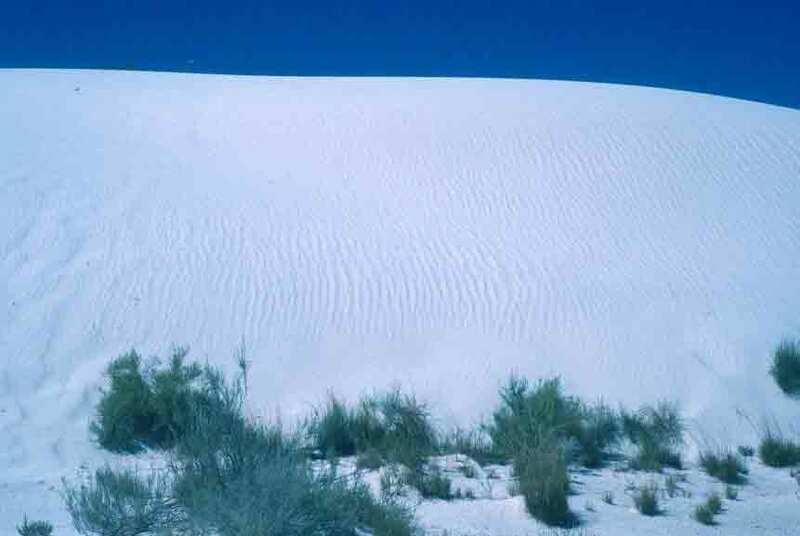 However, the pristine white of these dunes makes them especially delightful. The photos below do not do justice to the dunes, as it is not possible to capture the crystalline sparkle of the dunes, or the wonder of standing on a high dune and having a sea of white rolling away from you an all sides. But while they do not truly reflect the beauty of the dunes, they at least hint at it. If you'd like to get my book, you can click here—Waltzing Australia —and it will take you directly to the page on Amazon. Then come back here to look at photos and read of other adventures. © Notice: All articles and images posted to this blog are copyrighted by Cynthia Clampitt. Please attribute quotes and obtain permission to reproduce articles or images.